As anybody who has put together a music system of separates will tell you, cabling is not just important, its vital. Cables are the arteries of the system, carrying anything from potentially deadly voltages to the smallest and most fragile, complex signals, between the components. They do a lot of work, far more than is often thought and need to be right. Speak to any cable designer and they will tell you just how many issues there are to overcome and a look at the market will show that there are a huge number of designs available claiming to have come up with the answers. The fact that all cables sound different lets you know that, like audio reproduction generally, there is no absolute truth, only variations on a hopefully musical theme. Each designer will have their own way of meeting the challenges which is presumably why there are so many flavours of sound available. Cables are an antenna and they receive (and broadcast) all sorts of stuff at all sorts of frequencies, yet some of the very best are unshielded. But one thing all cable designers I have spoken to agree on is the importance of the dielectric. That’s the material that covers the wire itself, the first layer of insulation. Its performance is critical given the way that a signal moves through the metal with the high frequencies apparently travelling along the outside surface. Zero material would be the best and least intrusive dielectric but, unless you are dealing with very short lengths within a component, an air dielectric where nothing comes into contact with the conductors between the end connectors is an impractical ideal. 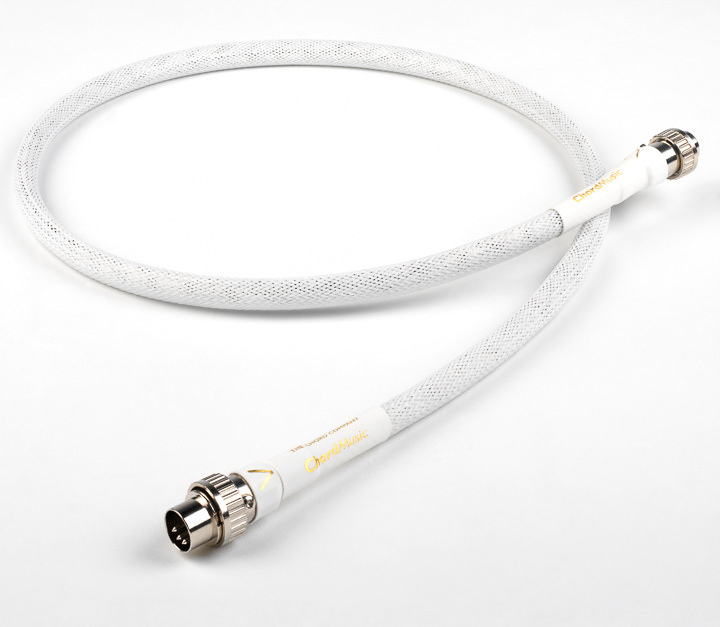 But, for a cable designer it is obviously of crucial importance and they are forever looking at new options to minimise or even eliminate the endemic side effects from this critical interface completely while maintaining the physical integrity of the design. The Chord Company has been designing and manufacturing cables for over 30 years now and along the way it has gained a considerable reputation for quality and value. Chord’s high-end models have been getting better and better, but it was a chance conversation that led to the creation of ChordMusic. When the company heard about what later became known as Taylon, it was by pure chance. But, after much negotiation, samples were sourced, and Chord’s Nigel Finn eventually sat to listen to a cable shrouded in the new material. He realised, within very little time, that this was a game-changer. The objective then became to design a whole new suite of cables utilising Taylon’s remarkable and desirable properties. The result is ChordMusic, a range of high-end audio cables that must be seen as their most accomplished and musically complete offerings to date. It is also the most expensive and musically certainly the most expansive. Ask The Chord Company what is sospecial about Taylon as a dielectric and they will certainly quote the fact that it is phase stable at room temperatures. I never really understood what this terminology meant but, after a long chat with the company’s Alan Gibb I began to understand that this directly relates to the speed and sense of timing which was one of the first things they noted from the early listening sessions. I can see why. Listen to music on ChordMusic and you are immediately struck with the ease and clarity of musical movement which is only enhanced by its added sense of resolution and exceptionally clean focus.